Prof. Jaworowski, our professor in Legal Writing, presented a unique comparison between an Office Memorandum and a Trial Memorandum by reading to us two very interesting versions of the old English fairy tale, "The Three Little Pigs." I enjoyed listening to her reading to us the story so that I am posting the two versions here. Once upon a time there was an old sow with three little pigs. She had no money to keep them, so she sent them off to seek their fortune. THe first little pig met a man with a bundle of straw, and said to him: "Please, man, give me that straw to build me a house." So the man did, and the little pig built his house with it. Along came a wolf. He knocked at the door, and said: "Little pig, little pig, let me come in." "No, no," said the little pig. "Not by the hair of my chinny chin chin." "Then I'll huff, and I'll puff, and I'll blow your house in," said the wolf. So the wolf huffed, and he puffed, and he blew the house in. And he ate up the first little pig. The second little pig met a man with a bundle of sticks and said, "Please, man, give me those sticks to build me a house." So the man did, and the little pig built his house with them. Then along came the wolf, and said: "Little pig, little pig, let me come in." "No, no! Not by the hair of my chinny chin chin." "Then I'll huff, and I'll puff, and I'll blow your house in," said the wolf. So he huffed, and he puffed, and he huffed and he puffed, and at last he blew the house in. And he ate up the second little pig. The third little pig met a man with a load of bricks, and said: "Please, man, give me those bricks to build a house." Soon the same wolf came along, and said: "Little pig, little pig, let me come in." "No, no! Not by the hair of my chinny chin chin." "Then I'll huff, and I'll puff, and I'll blow your house in," said the wolf. Well, he huffed, and he puffed and he huffed and he puffed and he huffed and he puffed. But he could not blow the house in. Later the wolf went to the little pig's house and told him what had happened. "A great round thing came rolling down the hill right at me," the wolf said, "Hah, I frightened you then," said the little pig. "I went to the fair and bought a butter churn. When I saw you, I got into it and rolled down the hill." The wolf was very angry indeed. "I'm going to climb down your chimney and eat you up!" he said. When the little pig heard the wolf on the roof, he hung a pot full of water in the fireplace. Then he built a blazing fire. Just as the wolf was coming down the chimney, the little pig took the cover off the pot, and in fell the wolf. The little pig quickly put the coer on again, boiled up the wolf, and ate him for supper. And the little pig lived happily ever after. 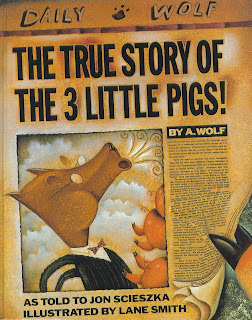 On the other hand, the second version, entitled "The True Story of the 3 Little Pigs" by A. Wolf (as told to Jon Scieszka) is like a Trial Memorandum which aims to persuade the reader to believe that writer's version of the story is the true version. 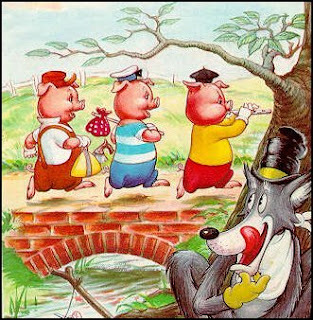 Everybody knows the story of the Three Little Pigs. Or at least they think they do. But I'll let you in on a little secret. Nobody knows the real story, because nobody has ever heard my side of the story. I'm the wolf. Alexander T. Wolf. You can all me Al. I don't know how this whole Big Bad Wolf thing got started, but it's all wrong. Maybe it's because of our diet. Hey, it's not my fault wolves eat cute little animals like bunnies and sheep and pigs. That's just the way we are. If cheeseburgers were cute, folks would probably think you were Big and Bad, too. But like I was saying, the whole Big Bad Wolf thing is all wrong. The real story is about a sneeze and a cup of sugar. Way back in Once Upon a Time time, I was making a birthday cake for my dear old granny. I had a terrible sneezing cold. I ran out of sugar. So I walked down the street to ask my neighbor for a cup of sugar. Now this neighbor was a pig. And he wasn't bright, either. He had built his whole house out of straw. Can you believe it? I mean, who in his right m ind would build a house of straw? So of course the minute I knocked on the door, it fell right in. I didn't want to just walk into someone else's house. So I called, "Little Pig, Little Pig, are you in?" No answer. I was just about to go home without the cup of sugar for my dear old granny's bithday cake. That's when my nose started to itch. I felt a sneeze coming on. Well, I huffed. And I snuffed. And I sneezed a great sneeze. And you know what? The whole darn straw house fell down. And right in the middle of the pile of straw was the First Little Pig- dead as a doornail. He had been home the whole time. It seemed like a shame to leave a perfectly good ham dinner lying there in the straw. So I ate it up. Think of it as a big cheeseburger just lying there. I was feeling a little better. But I still didn't have my cup of sugar. So I went to the next neighbor's house. This neighbor was the First Little Pig's brother. He was a little smarter, but not much. He had built his house of sticks. I rang the bell on the stick house. Nobody answered. I called, "Mr. Pig, Mr. Pig, are you in?" He yelled back. "Go away, wolf. You can't come in. I'm shaving the hairs on my chinny chin chin." And you're not going to believe it, but this guy's house fell down just like his brother's. When the dust cleared, there was the Second Little Pig - dead as a doornail. Wolf's honor. Now you know food will spoil if you just leave it out in the open. So I did the only thing there was to do. I had dinner again. Think of it as a second helping. I was getting awfully full. But my cold was feeling a little better. And I still didn't have that cup of sugar for my dear old granny's birthday cake. So I went to the next house. This guy was the First and Second Little Pig's brother. He must have been the brains of the family. He had his built of bricks. I knocked on the brick house. No answer. I called, "Mr. Pig, Mr. Pig, are you in?" And do you know what that rude little porker answered? "Get out of here, Wolf. Don't bother me again." Talk about impolite! He probably had whole sackful of sugar. And he would'nt give me even one little cup for my dear sweet granny's birthday cake. What a pig! I was just about to go home and maybe make a nice birthday card instead of a cake, when I fel my cold coming on. I huffed. And I snuffed. And I sneezed once again. Then the Third Little Pig yelled, "And your old granny can sit on a pin!" Now, I'm usually a pretty calm fellow. But when somebody talks about my granny like that, I go a little crazy. When the cops drove up, of course, I was trying to break down this Pig's door. And the whole time I was huffing and puffing and sneezing and making a real scene. the news reporters found out about the two pigs I had for dinner. They figured a sick guy going to borrow a cup of sugar didn't sound very exciting. So they jazzed up the story with all of that "huff and puff and blow your house down." And they made me the Big Bad Wolf. That's it. The real story. I was framed. But maybe you could loan me a cup of sugar.